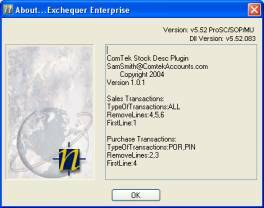 This Plug-in allows you to use extra stock description lines on Purchase Ledger transactions in Exchequer Enterprise, to display supplier specific information when purchasing. This information is removed when same stock items are used on the Sales Ledger of Exchequer. The types of transaction that the Stock Description Plug-in removes lines from can be changed in “StockDesc_Plug_Switches.ini” file. The types of transaction that the Notes Plug-in pops up for can be changed in Notes_Plug_Switches.ini file. The line description number, which will appear in line where stock code is specified. If specified, between the quotes, then removes lines beginning with character specified. Note : if specified then RemoveLines numbers are ignored. In the example above, on the sales side all transactions will have lines 4,5,6 removed. So only lines 1,2 and 3 appear on Sales Transactions. On the Purchase side only POR and PIN’s will be affected. These will have top line as the 4th line on the stock description (FirstLine = 4), and have lines 2,3 removed. Only lines 4,5 and 6 will appear on POR and PIN transactions. Note : If “FirstLine” specifies a blank description line then line 1 will remain in transaction. If stock description line starts with a space then the plug-in WILL NOT DELETE LINE the line. The parameter RemoveLines is ignored because RemoveLinesBeginningWith has been specified. Note this method of removal is faster than the first example when FirstLine = 1, because it does not have to lookup each stock record to compare the stock description lines. These settings are shown in the Exchequer Enterprise Help >> About window. Open the above ZIP file and extract "StockDesc.exe" to the Exchequer directory.